Hello! I’m back from my holiday in Finland. It was a jam-packed week filled with travelling around the country, eating rye bread upon rye bread upon rye bread and catching up with friends. I have oodles of photos from my travels to share with you and more than a couple of recipes too. But I’m feeling pretty tired today after all of the excitement and movement of the past eight days so I’ll leave the Finland post until tomorrow, if you don’t mind. 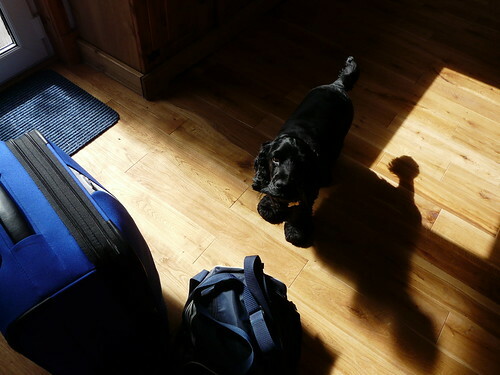 Until then, here’s one of my pup and my suitcases taken just before I left home. Think he knew what was going on? The fur babies always know when their mom or dad is going away — they get big eyes and I swear you can see a tear in the corner of one eye! I had one dog (Bridie) who came up once & sat squarely in the middle of my suitcase. Yet another hid a rawhide bone in my suitcase, and then looked alarmed when I zipped the suitcase and took it away. In that case, here I thought she was missing me, and really, she was upset that the bone was being taken away. I gave it back next time I came home and all was right with her world then. Rosy doesn’t get upset (yet) about suitcases, because she usually gets to go. I think they always know, Wendy. We we’re packing to leave, our cat hides under the bed. Maybe she thinks is we can’t find her, we won’t leave. Even my horse acts differently when we take luggage to the car. Maria – Am going to work on a ryebread recipe. Have tried before but didn’t manage to find dark enough rye flour. If I succeed I certainly share! Celia – I brought so much home I had to pay excess baggage fees! Christine – They are so sensitive to change, aren’t they? Pia – Oooh, we’d love to go to the ice hotel too! Sure you’ve noticed, I love all the Nordic countries. They really show their emotions on those little furry faces! our cats do too, even before the suitcase comes down from the loft!